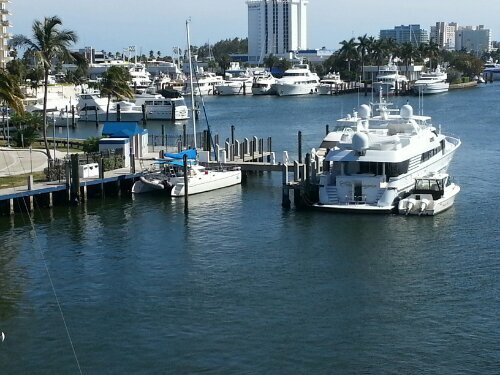 We are resting in Fort Lauderdale, land of the mega yachts, for a few days waiting for the offshore weather to clear. Our berth buddy is a boat once owned by Tiger Woods. Tango looks like a baby next to some of these big girls! Hello Tiny Tango. I can’t even picture Tiger Woods on a boat. Life of Pi, II. What’s the temp there today? It is 45 with crazy wind at Trac(e)y’s. It is in the mid 70s but quite windy. Miss all of you! Greetings from Titusville where we are also snuggled into a marina while it blows like crazy out there. Tango looks so cute in that pic. Which marina? It is crazy how windy it is right now. We tried to play on the beach last evening, but the sand stung too much!